A letter from Edwyn Sandys Dawes (1838-1903) to Henry Shelton Sanford (1823-1891), dated December 31, 1884. Dawes was one of the founding partners of Gray Dawes and Company. The lengthy letter discussed a number of business matters related to the Florida Land and Colonization Company (FLCC). In particular, Dawes rejected a loan proposal put forth by the Manayunk Bank, a Philadelphia-based financial institution with some ties to Sanford. Early in the letter, Dawes noted that "the board recognize[sic] [Sanford] as having control over affairs" and that he was sorry that the company's letter dated November 16th "failed to convey this to [Sanford's] mind," perhaps reflecting a fraught struggle for control and influence over the direction of the company. Later in the letter, Dawes confessed that "all your colleagues, myself included, have felt a good deal of timidity in following you in all that you have recommended and chiefly on financial grounds." 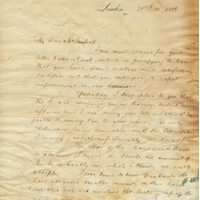 The letter demonstrates the often tense relationship between Sanford and his London-based partners in the FLCC. Sanford's financial strategies were often deemed too risky by his business partners. Dawes was one of the founding partners of Gray Dawes and Company, a London-based company founded in 1865 by business partners Archie Gray and Edwyn Sandys Dawes. Located at 13 Austin Friars in London, England, the company was focused, at least initially, on maritime insurance. By the mid-1870s, the company had also expanded its operations into shipping, overseeing a fleet of steamships that circulated within a trade network including London, Calcutta, Madras, and elsewhere. The company was closely linked to the Scottish shipping titan, Sir William MacKinnon (1823-1893). Gray was Mackinnon's nephew. Dawes, meanwhile, went on to become a close and trusted business partner to MacKinnon. As such, the firm became a useful means for MacKinnon to reward his friends and business associates. The company availed insurance accounts to these select individuals, accounts that could be used as a source of credit to be paid at a later date. The company became associated with Henry Shelton Sanford thanks to the mutual connection to MacKinnon. In 1880, MacKinnon lent Sanford, who was faced at the time with financial difficulties, some £8,000 to facilitate the founding of a Florida land investment company. The money offered by MacKinnon was in fact loaned to Sanford by Gray Dawes and Company. Additionally, at the behest of MacKinnon, both Gray and Dawes became reluctant subscribers to Sanford’s land investment scheme, the Florida Land and Colonization Company. Original letter from Edwyn Sandys Dawes to Henry Shelton Sanford, December 31, 1884: box 53, folder 7, subfolder 53.7.12, Henry Shelton Sanford Papers, General Henry S. Sanford Memorial Library, Sanford Museum, Sanford, Florida. Digital reproduction of original letter from Edwyn Sandys Dawes to Henry Shelton Sanford, December 31, 1884. Box 53, Folder 7, Henry Shelton Sanford Papers, General Henry S. Sanford Memorial Library, Sanford Museum, Sanford, Florida. Florida Land Colonization Company Collection, Henry Shelton Sanford Papers Collection, RICHES of Central Florida. Originally created by Edwyn Sandys Dawes. Dawes, Edwyn Sandys. “Letter from Edwyn Sandys Dawes to Henry Shelton Sanford (December 31, 1884).” RICHES of Central Florida accessed April 19, 2019, https://richesmi.cah.ucf.edu/omeka/items/show/4747.